BAMAKO. – Malians cast ballots in a presidential vote in the largely desert nation fractured by armed groups across its north and central zones since the last poll in 2013. Eight million voters were registered for yesterday’s election. After a campaign marred by violent incidents, 23,000 polling stations opened at 8:00am and were scheduled to close at 6:00pm. More than 30,000 personnel were drafted to ensure security. “I have my voting card, I am going to vote for my country and for my favourite president,” said Moriba Camara, a 35-year-old teacher, in the Sebenicoro district of the capital Bamako. In a message on UN radio, Mahamat Saleh Anadif, head of the UN mission in Mali, urged Malians to use their right to vote. “Dear Malians, do not add another crisis into the current crisis. Use this day to vote peacefully and respect the outcome,” Anadif said. Mali’s national broadcaster ORTM reported a large turnout of voters in the capital. Al Jazeera’s Mohamed Vall, reporting from Bamako, said voters told him they were casting their ballots “for peace”. “It is a keyword now, here in Mali. People are fed up. This is what they have been telling us. The incumbent President Ibrahim Boubacar Keita has miserably failed in stabilising the country,” he said. 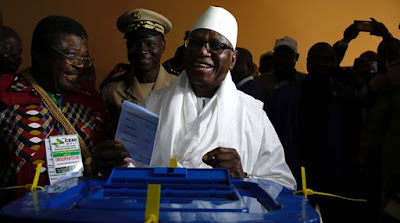 President Keita’s main rival Soumaila Cisse (68), is seen as having the strongest chance of ousting him, he said. President Keita (73), suggested during his campaign that peace had already been restored, saying he toured all over Mali and “nowhere did I feel afraid”. But insecurity was, in fact, such that in some parts of the country voting simply did not happen. The European Union observer mission urged the government on Saturday to publish a list of places that would be unable to vote so as to quell suspicions by candidates of “fictitious polling stations”. “These are polling stations in which we know insecurity … won’t make the vote possible there,” EU mission head Cecile Kyenge told journalists. The United Nations peacekeeping mission to Mali has suffered more fatalities than any throughout history, with about 170 peacekeepers killed, and human rights groups have raised the alarm over alleged executions by security forces. Insecurity has taken the shine off Keita’s achievements in the economy: average growth of around five percent during his leadership, and Mali’s important exports, gold and cotton, have flourished – as have agricultural staples, such as rice.